The Youth Cultural House in Ho Chi Minh City and Tuoi Tre Newspaper hosted a cultural program themed ‘Spring on the Sea Islands’ on January 3 at an indoor hall in the Cultural House with participation of more than 200 artists and 100 naval soldiers. 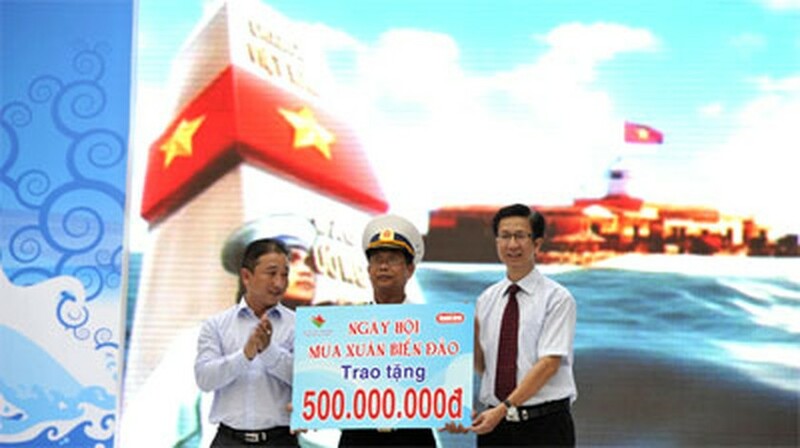 Tuoi Tre Newspaper editor-in-chief Pham Duc Hai (R) donates VND500 million to Colonel Nguyen Hai Trieu who is the representative of the Vietnamese Navy Unit in Truong Sa (C). The program featured several activities for artists, such as writing Tet greeting cards to soldiers on Truong Sa Island and others on the borderland; gift wrapping of candies and jams for the soldiers; and calling the soldiers. A photo exhibition titled “Sea, Island Sovereignty and Marine Resources” was also held showing photos of the Vietnamese islands, maps and sovereignty pillar. Other activities included a campaign to contribute stones to build on Truong Sa Islands and a calligraphy exhibition titled ‘Tribute to the Navy’. There were a lot of song and dance performances also, and the organizers raised funds for Truong Sa by selling the DVD ‘Homeland Sea Island’ featuring 260 artists. 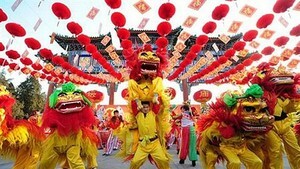 The celebrations were recorded and broadcast live on HTV9 channel.